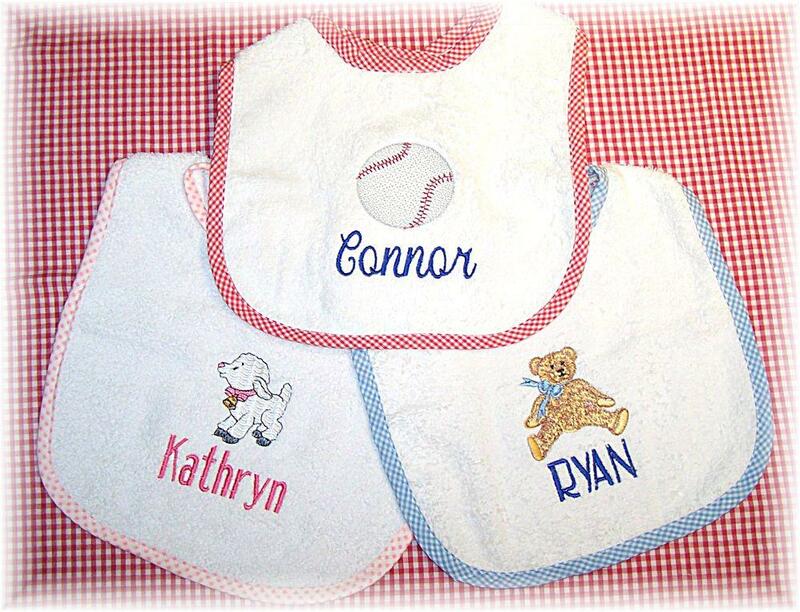 Personalized Baby Bibs. Super absorbent 100% cotton terry cloth personalized baby bib custom embroidered with your choice of designs and baby's first name underneath. Measures 11" x 13" with a Velcro closure. GinghamTrim: Pink, Light Blue, Red or Solid White Cotton. Alison, Gaelyn's bib turned out PERFECT! I am so pleased with it :o) I can't wait until I need another baby gift. I know just where to come and I can't wait to create another one (with your help of course). Alison, The bib turned out just perfect!!!! I can't wait for my sister to get it. I just know they are going to love it! Oh I am so excited! My sons' baseball coach and his wife are expecting their first baby. We just ordered a red trimmed bib with the baseball design and "Team Ritter" embroidered in red. I'm thrilled I found your site. Can't wait to get and give the bib! As a mother of five, I know you can never have too many bibs. I love to give a personalized bib to each new baby in our lives...something special (and useful) just for him or her. These are perfect! These are such lovely bibs. Your website doe not do them justice. They are very soft! I am told that baby bibs are old fashioned these day...but, I know that eventually they all come in handy! This is our favoritve baby gift to give. We always get wonderful reactions and it is so much fun to pick special designs for each baby. I got Sierra's bib in the mail today...I can't wait to give it to her!!! Thank you for your expert advice in selecting this gift. Your attention to this order is truly appreciated. I am excited to return to shop the next time I need a baby gift. Hi, after recieivng a beautiful blanket from your company for our son, I went online and ordered some bibs and burp cloths. I just got my special little package (thank you for gift wrapping it even though you didn't have too) I just love the bibs and burpies. I know that we will get lots of use out of these. They are so soft and the size will be great for a long time. I can't wait to use them in public.